Greek Chicken Quesadillas – Chewy flatbread covered in mozzarella and feta cheese and Greek-marinated chicken and grilled to perfection. Served with a tomato salad and homemade tzatziki sauce. In case you live outside the US, today we’re having a solar eclipse. My husband is a huge science/space nerd so there was no question that we had to see a total eclipse. In Atlanta, we were only going to be able to see 97.3% of the solar eclipse. So we traveled to Nashville to be able to see 100%. I was pretty bleh about the whole thing when we first starting talking about it, but now I am pretty pumped. Seeing a total eclipse is such a rare event so I bet it’s gonna be pretty incredible. Plus, we’re staying with our good friends here in Nashville so that’s made the adventure even more special. The only thing that could derail this day are the crowds. Yesterday, getting dinner in the city was insane – everything was crowded! Me and crowds don’t mix well. I’m trying to stay strong for my husband so we’ll see how this goes. Pray for me. I wish I could say today’s recipe is eclipse-themed. But sadly, it’s just a normal, incredibly delicious, flavorful dish. Actually, I take that back – these Greek Chicken Quesadillas are anything but normal. According to my husband, these are in the top 3 things I’ve made for him. EVER! What an honor, huh?! He even ate the leftovers for dinner two nights in a row. That’s an even BIGGER honor. I wish I could tell you what the other top two things are, but he changes up this list so frequently so I can’t keep track. He talks about these cinnamon rolls and these croissants croissants so much so I’m sure they’re on the list. Now, I have to warn you. The recipe looks long. Please don’t get intimidated! There are a few different steps to these quesadillas because (1) the chicken tastes best when marinated in Greek flavors and (2) I like serving the quesadillas with homemade tzatziki sauce and a chopped tomato salad. But you really don’t have to buy tons of ingredients – most of the same ingredients are used in the marinade, sauce, and salad. Garlic, olive oil, red wine vinegar, salt, and pepper will not be underutilized in this recipe, that’s for sure. But that’s when the tzatziki sauce and tomato salad come in. There’s an incredible amount of flavor in both of these that elevate these quesadillas to a whole other level. These steps will ensure you make the best use of your time – which is super helpful if you’re making these for a weeknight dinner. Make sure the chicken is diced before marinading – that will help it marinade and cook faster. You can even skewer this chicken and grill it if you want! When making the tzatziki sauce, make sure that you squeeze out as much water from the cucumber as you can. This will keep the sauce from getting watery. Speaking of watery, you also want to use strained yogurt (aka Greek yogurt) to make sure the sauce is nice and thick. I love the Fage brand because it is ultra-thick! Also, I recommend using real garlic, not garlic powder. You’ll get much stronger flavor from the real garlic, which is SUPER important in the tzatziki sauce. I’ve made it both ways so trust me – garlic powder doesn’t have the same oomph. When cooking the quesadillas, make sure to keep an eye on how the bottom is browning. If it’s getting too dark without the cheese melting, turn down the heat. The temp should be good between medium-low and medium. Chewy flatbread covered in mozzarella and feta cheese and Greek-marinated chicken and grilled to perfection. Served with a tomato salad and homemade tzatziki sauce. Cut the chicken into 1 inch cubes. Add to a large bowl with rest of the chicken ingredients. Combine with the chicken using a wooden spoon or your hands. Cover with plastic wrap and place in fridge to marinate for 30 mins- 1 hour. While you wait, skip down and make tzaziki sauce. Once the chicken is ready, heat medium saute pan over medium high heat. Once the pan is hot, use tongs to pull chicken from the bag and add to hot pan. Cook for 8-10 minutes until cooked through. Remove from heat. In a medium bowl, add oil and minced garlic. Whisk quickly to help blend the garlic flavor into the oil. Do this for 1 minute. I used a mini food processor for this but if you don't have one, whisking violently in a bowl will do. Add yogurt, cucumber, and rest of tzatziki ingredients to medium bowl with oil and garlic. Combine with a spoon or spatula. Let it sit in fridge until quesadillas are prepared. Add all the ingredients to a medium bowl and stir together. Give it a taste and add more salt/pepper if necessary. Add 1/3 cup of mozzarella cheese to each flatbread. Add 1/2 tablespoon of feta (or more!) on top. Finish with 1/3 cup cooked Greek Chicken. Heat large saute pan to medium. Add 1/2 tablespoon of butter to pan. Once it's melted and bubbling, add flatbread with cheese and chicken so it can cook. Add empty flatbread on top and press down with spatula. Let it cook until the cheese starts melting and the bottom flatbread has turned golden brown (3-5 minutes). Flip quesadilla so the other side can brown and cheese can melt all the way. Remove quesadilla and cut into 4-6 slices. Turn the heat down if the outside is browning before the cheese is completely melted. Repeat with 3 other quesadillas. Serve with tomato salad and tzatziki sauce. Yummy this is so good!! I have to make this. Omg, this looks beyond delish! Must make asap! Quesadillas are our FAVE! That sauce looks amazing! Thanks Denay!! That’s so sweet of you to say!! I love chicken quesadillas! I’ve never thought to try a greek version, but this sounds amazing! Right?! I was shocked that I hadn’t thought of these sooner. Quesadillas are so versatile! These look so amazing! I pinned them before I even read the recipe, I know they will be so great. I love anything Greek! Oh my goodness! YUM! I know what I’m making for dinner later this week! Yay! You’re gonna love them! 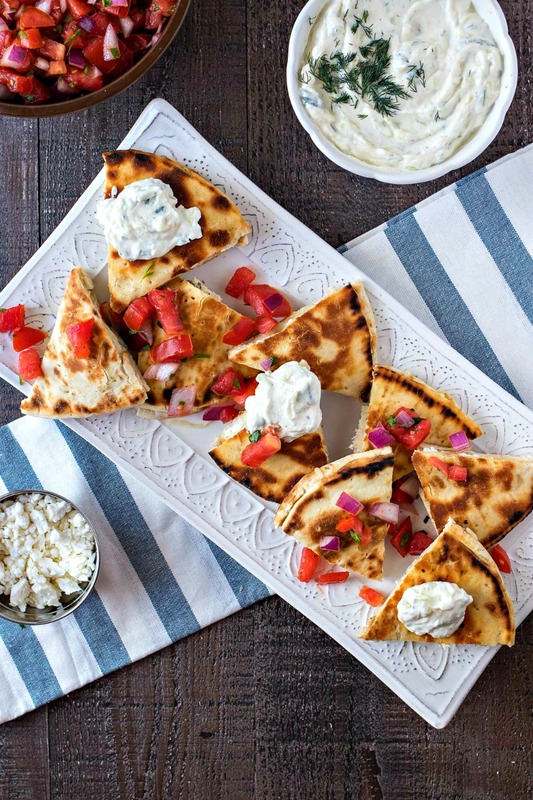 Never thought of Greek quesadilla, incredible idea! Thanks! I was shocked I hadn’t made them sooner! I never would have thought to put these flavors into a quesadilla, but it makes so much sense. And I love tzatziki! Omg the tzatziki is my favorite part! This looks really good, and you could totally make it eclipse-themed if you kept the bread round! Oh my goodness does this ever look good. The tzaziki sauce looks amazing too! Thanks! I think it’s my favorite part! This looks too good!!! I wanna try this this week! I love quesadilla’s! One of my fav foods! Thanks Kat!! I am so in love with them. Let me know if you try them out! I love quesadillas. This sounds so yummy!